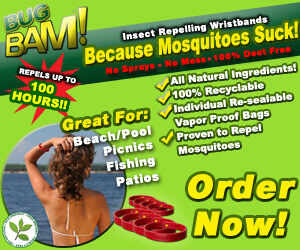 Better than messy sprays, lotions or stinky vitamin patches, Bug Bam Wristbands safely repel Mosquitoes and other flying, biting insects NATURALLY! Each Bug Bam wristband is effective up to 4 feet from the wearer depending on the situation and comes in a vapor proof re-sealable bag. All ingredients and materials have been proven non-toxic and safe for children of all ages and the product is non-irritant to the eyes and skin. The included bag is re-sealable and will extend the lifespan of the product when not in use. It will also keep the product re-usable for up to 2-years if stored in a cool re-sealable, dry place. In between use, just seal the product back in the original re-sealable bag until you’re ready to use it again. TOTAL USE TIME = up to 100 HOURS! This means if you take it out once for 10 hours and seal it again, you’ll have 90 hours left when you re-open the bag and use it again. No Liquids. No Mess. No Worries!